I shiver and wish I had brought a sweater. The sea breeze is cool, not cold, but tiredness is getting to me. Yet I can’t move. The sight is too imposing, too unreal even. It’s simply impossible to get up and return to bed. 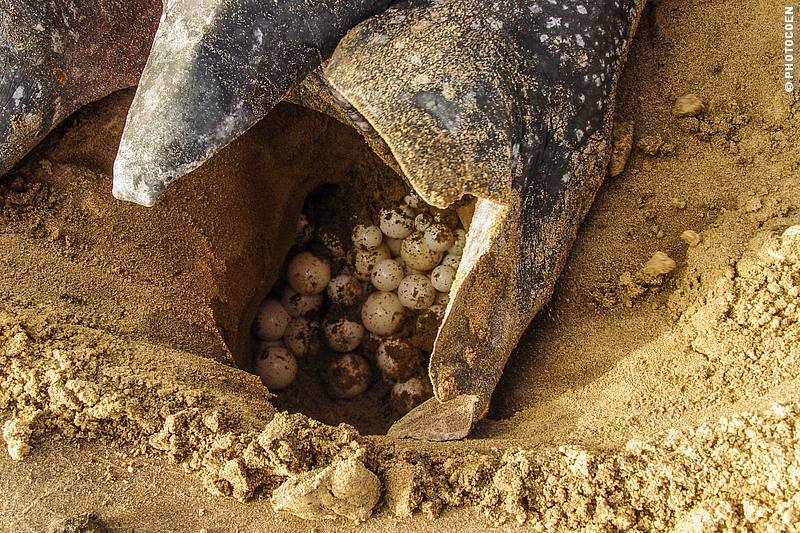 How often do you sit next to a two-meter-long turtle, weighing 450 kilos that is depositing her eggs? Watching Sea Turtles – Simply Magic! Despite the rainy season we have a cloudless sky and even an almost full moon. The latter stops me from attempting to turn on my flashlight. Light, as well as other aspects as moving too close to the sea turtle would disturb her. 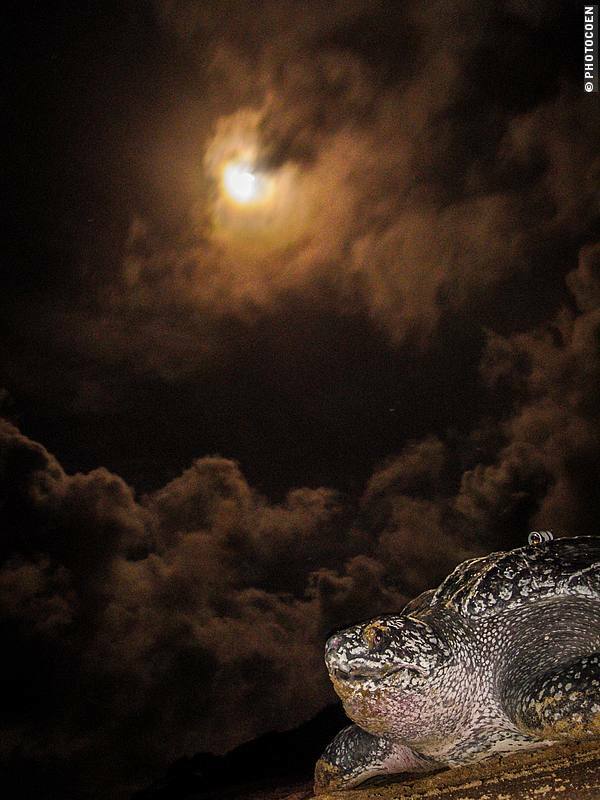 The moonlight facilitates spotting the turtles that annually come to Awala beach in French Guiana to lay their eggs. During the past two hours we have seen three green turtles and have now stumbled upon a leatherback. The sounds of the wind and the breaking of the surf retreat to the background as I listen to the huffing and puffing of this prehistoric reptile. Her head, the size of a football, turns to me and her black eyes light up in the light of the moon. She opens her mouth, giving way to a deep sound from her throat, betraying her exhaustion, her suffering to get her job done. 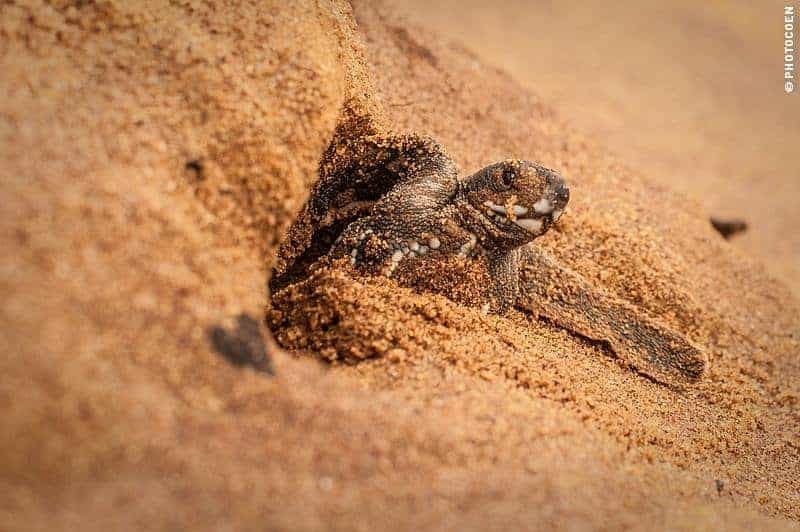 She turns her heavy body a quarter turn and starts sweeping sand with her front flippers to hide the exact location of her nest from predators. There are three main predators at Awala beach: stray dogs, black vultures and Homo sapiens. The birds of prey are a given, there is nothing you can do about them. 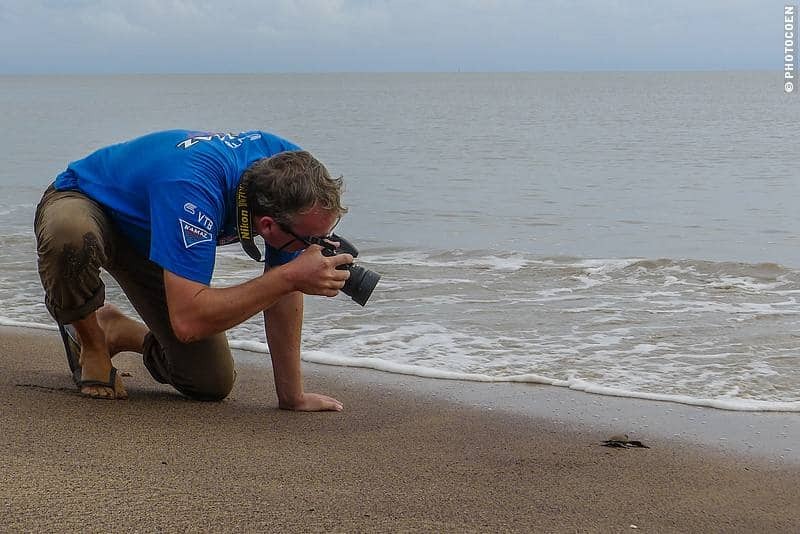 The problem of the stray dogs, however, is dealt with although not exactly in a prize-winning manner but does reflect an attempt to give the new generation of turtles a bigger chance of survival. 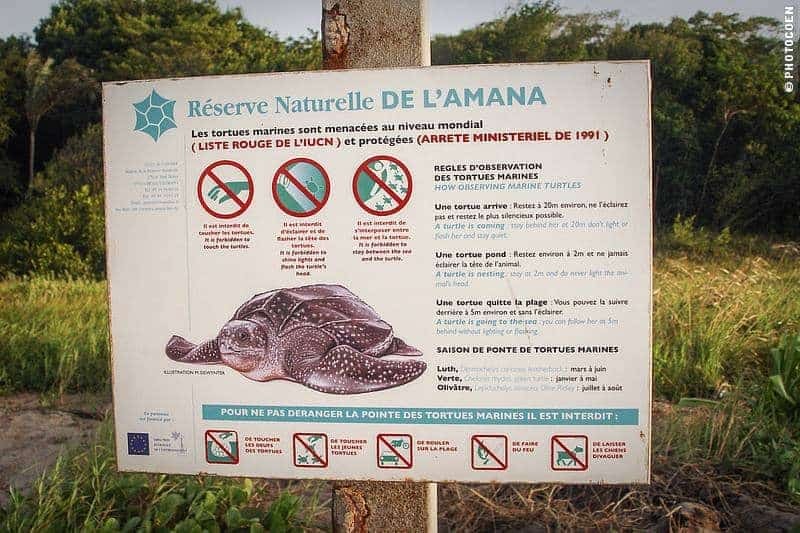 The inhabitants that live near the turtle beaches of Cayenne, French Guiana’s capital, and Awala-Yalimapo have received a notice from the town hall, warning them to keep their dogs indoors or at least collar them. All un-collared dogs are picked up and kept in an animal home and if not reclaimed within eight days, euthanized. The measure sounds more drastic than it is. It is largely executed by volunteers and the animal home is in Cayenne. The volunteers come to Awala-Yalimapo once a week, during the day when most of the dogs are hiding and sleeping, difficult to find. The dogs are at their most active at night, when the turtles come. Each night we see at least ten of them, sometimes near a turtle, waiting for her to finish depositing her eggs so they can devour them as soon as she is gone. 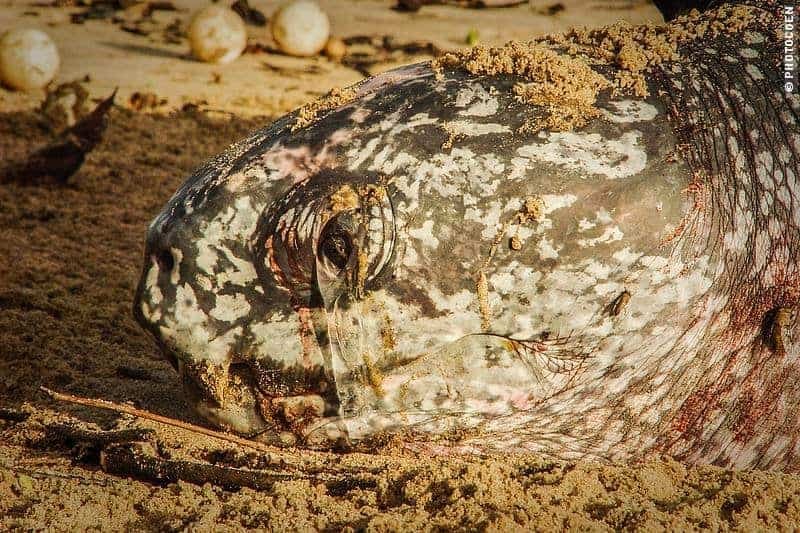 Remains Homo sapiens, who fishes with too large nets, who pollutes the waters with oil and other garbage, who inhabits the beaches where due to the interference of light the turtles can no longer orientate themselves and stay away, or go inland instead of returning to the ocean. 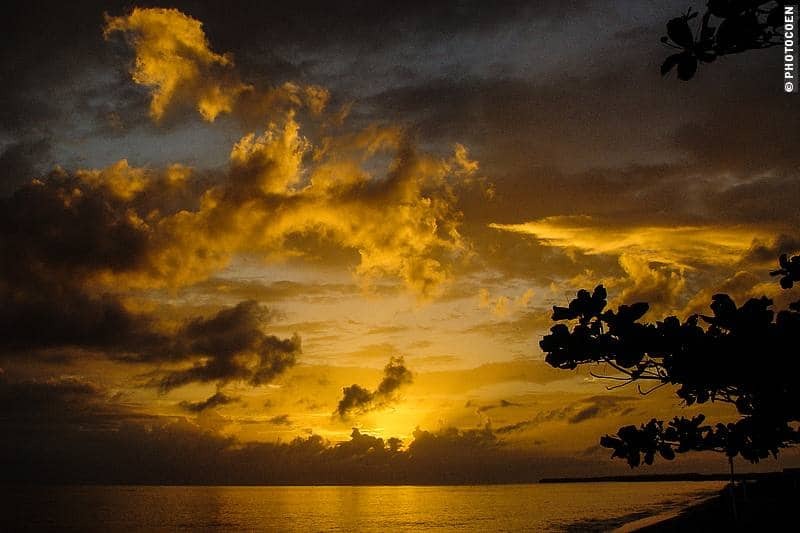 The Amerindians who live along the coast claim they have an age-old custom of eating turtle eggs and meat. The government struggles with their argument that they want to be allowed to hunt protected animals, such as tapirs and turtles, because their ancestors did so, and discusses giving permission for a quota of eggs. Allowed to Eating Sea Turtle Eggs or Not? Here is my issue with such measures. If Amerindians want to live like their ancestors, no problem. But go back to the forest then, live in palm tree huts and on what nature gives. The thing is they don’t live like their ancestors. Their ancestors ate eggs, without commercializing them on a large scale as happens nowadays (by the way, this problem is much bigger in Suriname, where poachers are caught at regular intervals with thousands of eggs). Nowadays, many Amerindians profit from the system of a modern society and live on welfare. Since they receive money, they may as well buy chicken eggs. Why receive money and yet not have to buy part of their food such as turtle eggs and tapir meat? It doesn’t make sense. It doesn’t make responsible citizens either. By giving out these permits we create another generation of people who know only rights, not their duties. I don’t like to reflect too much on such issues. It drives me mad because it is a never-ending story. I’d better return to my own personal life and focus on that – trying to be a good person for myself and my immediate surroundings. And so I sit on the beach and admire the turtle. I take in the movements she makes, I listen to the rasping sounds as she gasps for air and with one strong movement forces her body to move yet another quarter turn. One last sweep with her hind flippers and she is done. She glides down the steep hill of the beach and with little effort reaches the shore. I can feel how the water welcomes her, she dives in head first and disappears into the depths of the ocean. I really want to go here and experience this. This has been added to my bucket list!